The advent of the Flying Bomb V1 weapon brought about many tales and jokes. Q. Why is a doodlebug like Bob Hope? A. First you bobs then you 'ope! A German prisoner was captured and brought into the Intelligence office for interrogation. Strangely he was laughing and seemed very happy to be in captivity. The interrogating officer asked him why he was so cheerful. German: " Because of the tremendous power of our new weapon - the V5". Officer: "V5? What sort of weapon is this new V5?" German: " It is a large piece of white cloth attached to a long pole!" I hear strange noises overhead. But doodlebugs a passing by. My heart into my mouth nearly sails. Will it, won't it, pass me by? Stay up and doodle in the sky. As under tables we all race. Then comes daylight - off to work. and below him was a cat sleeping on the floor. The parrot was shown to be saying to the cat: "If you must purr, don't cut out in the middle!". The American Stars and Stripes newspaper ran simple, short and pointed poems in its "Hash Marks" pages. "What's buzzin', cousin? ", and especially for Londoners: "Little man you've had a buzzy day!" Defence weapons (D1, D2, D3), were to be found in regular use in conversation in the pubs. D1 was a shelter from attack. D2 was the consumption of "Doodlebug juice"- beer or spirits if available. D3 was a date with a lady who was sufficiently interesting and attractive to take one out of this world. Members of the public began to develop much superstition about the V1. It was tempting to say: "That is one of ours". The V1 had a roaring sound that could be confused with a flock of heavy bombers or some other mechanical vehicle. It was tempting to say: "Those are bombers," "That is a jeep," "That's just a motorbike". Such statements were considered as "famous last words", and the public would knock on wood just after saying them. The Job's comforters being more pragmatic and fatalistic pub-goers would say: "If it's going to get you, it's going to get you wherever you are !". Such statements were tolerated but one statement that was always considered impertinent and discourteous was to say: "See you tomorrow - maybe.". Such a statement was always considered a tempting of fate! Some days as many as a 100 V1 bombs found their way to the southern England area. Despite this the people of Britain got on with life taking it day by day. 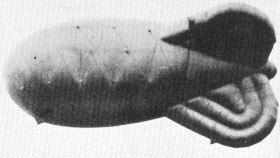 It is a general assumption that the V1 Flying Bomb was invented by Germany but in fact the first one was invented at the Royal Aircraft Establishment at Farnborough in 1927. It was a conventional form of aircraft, boasted radio control and a powerful warhead. The British Government was asked to continue funding research and development but refused at the Government considered that such a weapon was not in accordance with the Hague Convention. Clearly Hitler did not think the same. A deception concerning the V1 was also played on the Germans using double agents. MI5 had these double agents provide Germany with damage reports for the June 1944 V-1 attacks which implied that on average the bombs were travelling too far and were overshooting the intended target. Although the Flying Bombs had in some cases been fitted with radio-transmitting systems to confirm their range the Germans chose to believe the agents and altered the fuel load to prevent overshooting the target. As a result the false witness accounts and many lives may have been saved by the lower fuel load causing many of the flying bombs to fall short of the intended target. Approximately 6184 people killed by V1's and 17,981 were seriously injured. Tens of thousands of others received lesser injuries.